When in pain, should swallowing pills really be our first resort? Can’t sleep? Take a pill to knock you out. Problems focusing? Take a pill to boost your energy. A pounding headache? Take a pill to dull the ache. There is no question that modern medicines have helped us both manage pain and save lives by staving off often fatal illnesses like cancer or heart disease. But there can be a darker side to prescription drugs, which, at best, can see us grow resistant to their effects and at worst lead to addiction or even death. Perhaps worse still is our reliance on them, as a major report last year stated that half of us take at least one prescription drug daily. 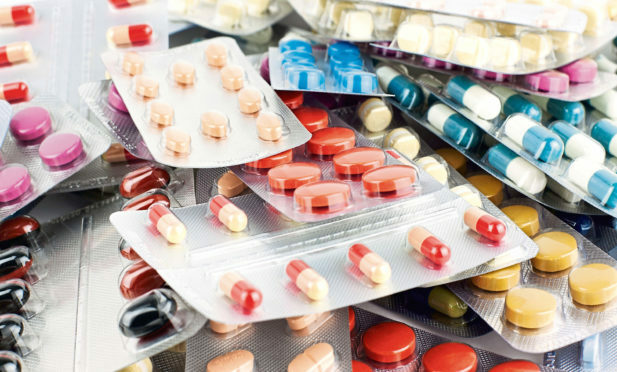 The NHS Digital survey of more than 8,000 adults showed that one quarter of people are on at least three drugs at any given time, with blood pressure pills, painkillers and indigestion remedies some of the most prevalent. Of course we are not yet approaching anything like the levels of America’s current opioid crisis, but the warning signs are there. Yet for those out there who suffer daily from chronic pain, anxiety, insomnia or other conditions which require some level of pain management, swallowing a cocktail of pills can feel like the only solution. Emma Armes was a paramedic for 17 years before severely injuring her back and being forced into medical retirement. “I had a prolapsed disc in my back,” said Emma, 44. “I had a few operations to try to get rid of the pain along with physiotherapy, acupuncture and medication. “But nothing helped and I fell into a depressive state, it was a really dark time in my life. “One day I saw an advert on Facebook for a local hypnotherapist and thought I’d give it a try. “I had nothing to lose and it felt like it’d exhausted every other option to get rid of the pain I was in. “It ended up being the most amazing experience which absolutely changed my life. 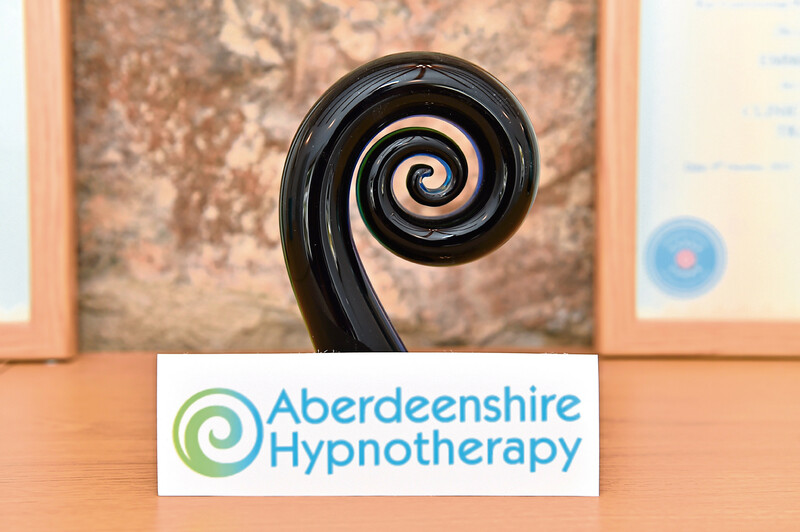 Inspired by her experience, Emma retrained as a hypnotherapist herself, and in March 2016 opened her own practice in Aberdeen. In May of the following year, Emma came across OldPain2Go. This branch of hypnotherapy aims to dramatically change how pain messages in particular are processed by the body, reducing or removing old aches and pains altogether. “Hypnotherapy is all about speaking to the unconscious mind,” she said. “Our daily lives are controlled by just 10 per cent of the brain while the other 90 per cent is the unconscious mind. “Hypnotherapy is all about connecting with that 90 per cent. “There is no touching or manipulation, which people can find hard to get their head around. “Because we are dealing with the mind we can ask it to do anything, so hypnotherapy can work with a whole range of ailments from physical pain and anxiety to stopping smoking. “Pain itself is a warning message, for example new pain can be touching a hot ring on the cooker. “This pain acts as a protective mechanism telling you to avoid something which will cause you hurt. “When you act on this the pain is meant to go away, like a switch in the brain being flicked off. 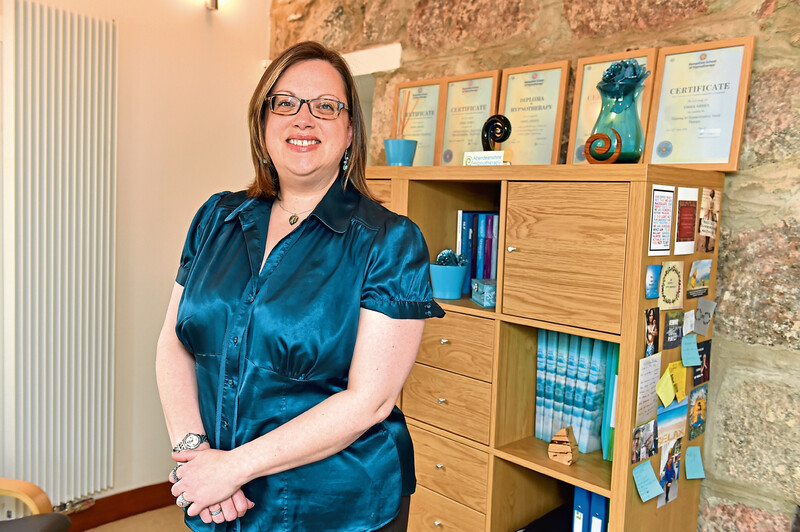 Despite the success of her own treatment and the testimonials of her clients, Emma is well aware that hypnotherapy is often regarded with suspicion. “As a nation we put our trust in traditional practices and the NHS,” she said. “My husband is a doctor and I used to be a paramedic – I totally get it. “But there are new things out there now which GPs often don’t get training in. After years of struggling on painkillers, this is something that Ellon resident Julie McIntosh has recently come to realise. In 1998, at the age of just 26, she suffered a stroke, leaving her in excruciating pain and with a reliance on prescribed pain relief. Physiotherapy helped to an extent, but left-sided weakness and perpetual shoulder and neck pain were becoming more and more unbearable. “I had tried everything,” said Julie, now 46. “Painkillers, botox, therapy… you name it. It was only by luck that at a horse trials event Julie began chatting to a manager at ArcEquine – a portable device for injured horses that promotes faster healing through microcurrent therapy. With countless success stories on livestock and nothing to lose, Julie took a chance and began using the human equivalent, Arc4Health. “The change in me has been amazing,” she said. “I still have some weakness in my left hand, but to have no more pain has been just wonderful. Aberdonian therapist Sam Luxford is familiar with Julie’s situation. “People tend to try all different forms of medication for years before even considering other options,” she said. “It’s not airy fairy and there’s no rainbows and dolphins flying around in my practice room,” she laughed. “Alternative therapies like hypnosis are scientific and are all about taking back control. “I was a nurse for 25 years but one of the reasons I left that career is that very often nursing is just a case of managing symptoms – not treating the root cause. “Understanding how the brain works is so important, and it’s quite possible to use the way we think as a measure of our health. This is easier said than done however, and making real lifestyle changes is much more difficult than swallowing aspirin. It can even come down to something as simple as having a headache. Do you drink some fluids and take a rest? Or do you reach for the painkillers? According to Tessa Grinlinton, a New Zealand massage therapist working in Aberdeen, the name of the game is getting fast results. “I focus on a type of therapy called Kinetic Chain Release (KCR),” she said. “It’s all about bringing the body back into balance using a combination of joint mobilisation techniques and stretches. “All these stretches and techniques already exist, but KCR uses them in a certain order which is what delivers the results. “Almost all my clients see significant improvements after just one session. KCR is recommended to alleviate problems such as chronic pain, knee pain, neck pain, IBS, fibromyalgia, carpal tunnel syndrome, breathing difficulties and many more. Although it has been around for approximately 35 years and was in fact invented by Scottish physiotherapist Hugh Gilbert, KCR remains a relatively unknown branch of massage therapy. Yet Tessa is pleased that the results speak for themselves. “It’s becoming more and more recognised as time goes on,” she said. “Particularly in Scotland which has the highest concentration of KCR therapists in the world. “I have had clients who have been on the waiting list for surgery with the NHS yet have had their ailments resolved with me in the meantime. “I remember one lady called me and said she had just bent down and managed to touch her toes for the first time in two years. “Another rang to tell me she had been able to walk down the stairs without crippling pain, and that KCR had changed her life in a way that medication never could. “It’s my firm belief that people don’t want to take painkillers for the rest of their life, and recently there has been a shift in the way we look at our health. “There is a trend now to take care of our bodies more than ever before. Alongside this, Tessa positively reports that attitudes are changing when it comes to alternative therapies too, and that she has recorded a big upsurge in people searching out different methods of pain relief. So next time you have that twinge of back pain, it might just be worth looking a little further than the medicine cabinet.